Those are two words that should always be together and, thanks to donor support, they are! St. Joseph’s is blessed to provide several outreach programs for Native American families living on reservations. One is the St. Joseph’s Bookmobile. 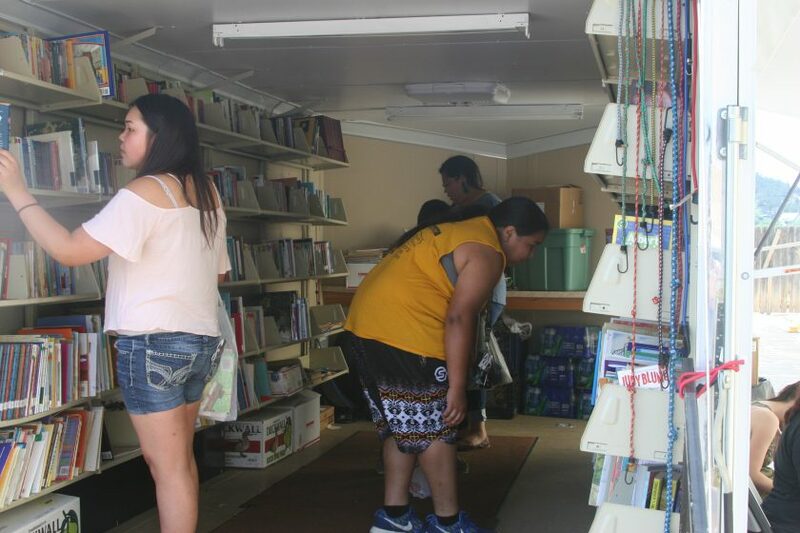 Each summer, St. Joseph’s Bookmobile travels nearly 3,000 miles across South Dakota and North Dakota reservation communities to distribute free reading materials to Native American children and families in need. Andy, Alumni Liaison at St Joseph’s, said it all took place during the heat of summer that saw temperatures as high as 104 degrees. “But we still had fun!” he said. 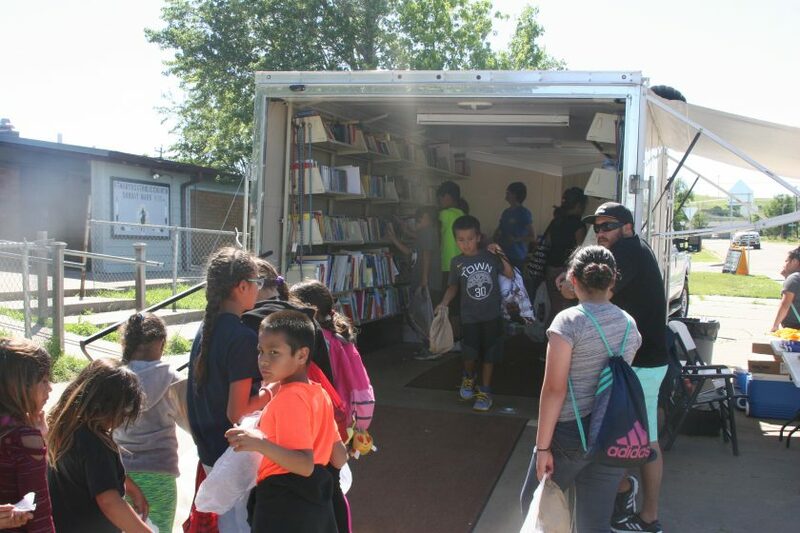 How many books did our Bookmobile distribute during the summer of 2018? Over 6,500! If you are a supporter of St. Joseph’s, you know a little heat can’t stand in the way of giving – giving brings a giver joy. And boy, were we joyful! 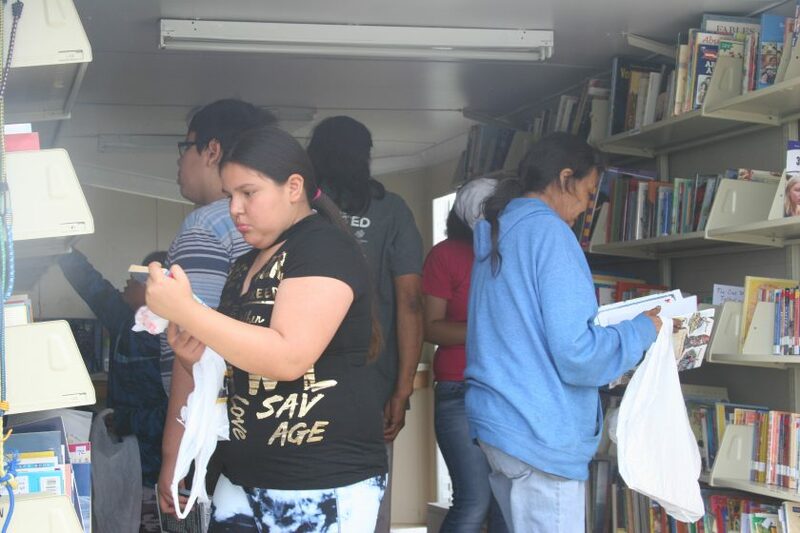 During the summer of 2018, the Bookmobile program put over 6,500 new books into the hands of 902 youth and 430 adults. St. Joseph’s also gave out over 24 cases of water, three cases of peanut butter and jelly cracker sandwiches, six cases of cookies and three cases of apples. Where was all that goodness distributed? Thanks to your support, we blessed the following communities: O’Kreek, Mission, St. Francis, Rosebud, Allen, Martin, Parmelee, Lower Brule, Wanblee, Potato Creek, Kyle, Porcupine, Oglala, Pine Ridge, Manderson, Crow Creek, Ft. Thompson, Lake Andes, Marty, Wagner, Mitchell, Sioux Falls, Rapid City, Cherry Creek, Eagle Butte, Dupree, Timber Lake, Little Eagle, Bullhead, McLaughlin, Wakpala, Kenel and Ft. Yates. Books, books and more books! The St. Joseph’s Bookmobile traveled to reservations all over South Dakota this summer distributing free reading materials. Our dedicated staff also uses the Bookmobile route to visit with former students (62 this year to be exact), meet current and prospective families and hand out student applications. Jeff, one of the counselors at St. Joseph’s, started going on Bookmobile visits as a child when his parents worked at St. Joseph’s Indian School. Now, as an adult he has his own job at St. Joseph’s. As a counselor, he does home visits throughout the year. But, traveling with the Bookmobile in the summer allows a good atmosphere to meet families – it’s relaxed and enjoyable. It’s the perfect time to interact. Pilamaya – thank you – for supporting St. Joseph’s outreach programs like this one. Is there a way we can donate books? I have a dozen or more books ages 8-15 would be interested in. St. Joseph’s Indian School is committed to promoting reading throughout the year. Our bookmobile visits remote communities on South Dakota reservations and we are always happy to accept books for children and adults. Call 1-800-341-2235 to coordinate with our Donor Care Center staff. That’s great. I remember buying books in my early school years. I was so excited. Thank you. The book mobile added so much joy to my rural farm life! Thank you Lord Jesus for these folks! That’s wonderful to hear, Larry! Thank you!